Explore the nature of EM radiation from a black body. Show that Power/Area is proportional to T4. State and apply Stefan - Boltzmann and Wein's laws. 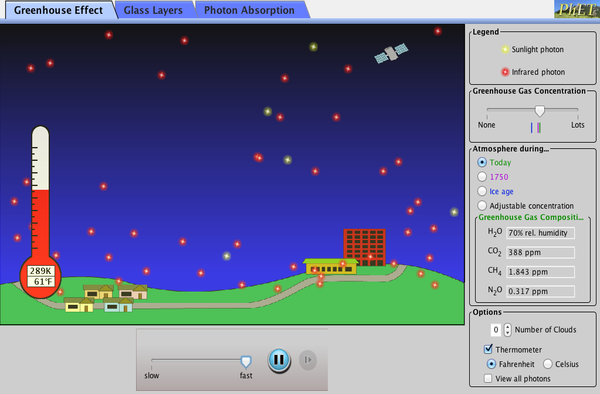 Describe the interaction between EM radiation and different types of matter. Define surface heat capacity, emissivity and albedo. Build an iterative simulation of the Earth - Sun system with Excel. Energy from the fusion of hydrogen in the core of the Sun heats the gas on the outside causing it to emit light. Why doesn't the core emit visible light? Why doesn't fusion take place in the outer layers? When a body is heated it gives out energy in the form of EM radiation. The amount of energy emitted from a body per second depends on the temperature let's investigate the relationship. During the experiment you will measure the voltage and current so will be able to calculate the resistance at different temps then use the table to find the temperature. The radiant power will be measured using a thermopile. This produces a voltage that is proportional to the radiation it absorbs. You should make sure this is only exposed to the light source for short periods of time or it will get hot. A silver shield is provided for this purpose. Starting at the lowest voltage setting (2V) switch on the light and measure the voltage and current. Remove the shield and measure the pd from the thermopile. Enter the data into a spreadsheet and repeat for all settings on the power supply (2 V - 14 V). In you spreadsheet calculate the Temperature for each setting. Plot a graph of Thermopile PD (proportional to power per unit area) vs Temp. Not all bodies are perfect black bodies. The emissivity is the ratio of radiation emitted to that radiated by a black body so a body with emissivity 0.5 will emit half the radiation of a black body. Which surface has the highest emissivity, polished metal or brick? Try measuring the radiant heat from the different coloured sides of the "Leslie's cube". A spectrum shows the intensity (P/A) at each wavelength. Use the simulation below to investigate the change in the spectrum at different temperatures. What does the area under the graph represent? Set the temperature to the temperature of the sun and note the position of the peak. What happens to the peak as the temperature is reduced? You can see how the peak changes by tracking it in this simulation. Given that the peak of the Sun's spectrum is at 500nm, use Wein's law to show that the temperature of the Sun is 5800K. Given that the temperature of the Sun is 5800 K use Stefan - Boltzmanns law to show that the power per unit area from the sun is 6.42 x 107 Wm-2 . The radiation from the sun spreads out in an ever increasing sphere. Starting with Carbon monoxide try shining different wavelengths of EM radiation at the molecules. Make a suitable table for your results. Note that a short time after absorbing the radiation the molecule returns to its non excited state, when this happens radiation is re emitted but in a random direction. The following graphs show the % absorption of radiation by 3 different gases. Use the results from the simulation to explain them. Absorbed resulting in an increase in temp. No light passes through the earth so that leaves 2. Why is the area used πr2 and not 1/2 x 4πr2 which would be the area of half of the Earth? Show that the average power per unit area over the whole Earth is 350 Wm-2. When energy is absorbed by a body the increase in temperature depends upon the specific heat capacity of the material and its mass. When heat is absorbed by the earth the temperature rise depends on the Surface heat capacity and the area. If the intensity of radiation is 350 Wm-2 calculate the rise in temperature in 12 hours (assuming no heat lost). Which surface has a higher albedo snow or asphalt? The average albedo of the Earth is 0.3, show that the power reflected per m2 is 105 Wm-2. The Earth absorbs energy from the Sun and which increases its temperature, this causes the earth to radiate EM radiation itself until the energy absorbed = energy radiated. At this point the equilibrium is reached and the temperature will stop rising. If the albedo is 0,3 and the average intensity is 350 Wm-2 show that at equilibrium 245 Wm-2 must be radiated. Use the Stefan - Boltzmann law to show that the if the temperature of the earth needed to radiate 245 Wm-2 is 256 K.
Referring to the black body simulation show that the peak in the spectrum for a 256 K body is in the IR region. You have seen that the radiation emitted by the earth is mainly in the IR region, will this be absorbed by the atmosphere? This is the name given to the effect of the atmosphere absorbing radiation and re-emiting it back to Earth. EM radiation from the sun is mainly in the region. This passes through the without being absorbed. The radiation lands on the Earth where some is . The rest is causing the temperature of the earth to . The Earth emits radiation in the region of the spectrum which is absorbed by the atmosphere and re- radiated in directions, some of the radiation goes back to the Earth causing the temperature to until the amount of energy radiated through the atmosphere equals the energy absorbed by the Earth. Set the values as in the previous example to see if the numbers match. Observe the effect of changing the variables. Now you can build your own model in Excel follow the instructions on page 359.